When we research for Historical novels there are so many different things we look up. 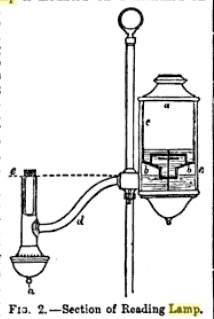 Below is a post I did on 19th Century Lamps. I hope you find it interesting. I thought I'd post a simple item on lamps but my, oh, my, there is a lot to say about lamps during the 19th century. Encyclopedia Britannica ©1824 has this to say. 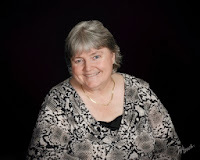 The link brings you to Google books. The article starts on page 207. At the beginning of the 19th century lamps were primarily oil lamps of some sort. Argand lamps were developed during the last quarter of the 18th century. 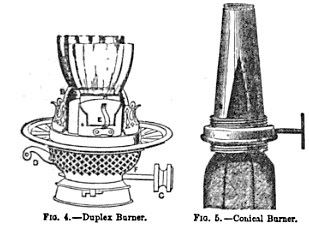 The Argand lamp included a burner and a chimney. The reservoir was on the bottom then the wick was feed into the oil. We have a variety of oil lamps developed with this simple system during the early part of the 19th century. As the Victorian era came into vogue the lamps became more fashionable. In other words, the more elaborate the lamp the more your wealth and good taste showed to those around you. That did not negate the need for practical lighting. Below are two images from the 1890 Encyclopedia Britannica. The first is a reading lamp. Generally as writers we might have a tendency to think in only table top lamps. But these reading lamps could stand on the floor or be mounted to a wall. 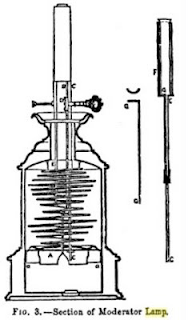 The second image is of an 1838 invention by M. Franchot called the moderator lamp. This helped to pull the oil up to the end of the wick for a brighter flame. A further invention of the flat wick was developed in the image below. In an 1865 patent Messgrs. Hinks claimed it could have two or more flat flames. The other key ingredient for these lamps was the oil. We've all read and heard about the whaling industry and how whale oil was the best oil for burning. Animal and Vegetable oil were the first oils used. Mineral oil began being used in the 1830's, specifically because of the invention of the moderator lamps. Another names for these lamps is "Camphine, Vesta and Paragon lamps. They light given off by these lamps were brighter and less smokey. However they produced soot-flakes which made people nervous about them being more dangerous. Do you think these types of lamps were used out west? The flat wick definitely went out there. I imagine some form of a reading lamp was out there as well but the reservoir might have been different. Also it would depend on what time period it went out west. The later part of the century you had trains as well as ships heading out there regularly. But you also had tradesmen moving out west too, not in it for the gold to dig from the ground but making the gold from those who were gold mining. Interesting post about lamps. Do you have any of these older lamps? No. I used to have an old camping lantern but I prefer the newer propane Coleman lanterns. I always wince when I think about using these old lamps. Not only from danger of fire, but the smoke and the way they attract bugs. Interesting post. Thanks for sharing. You're welcome. I also don't like having to clean the chimneys a lot of suet. Thank you for sharing, Lynn. Very interesting! I go to my oil lamps when our electricity is off.